Egypt's Prime Minister Sherif Ismail (R) listens to rescue workers as he looks at the remains of a Russian airliner after it crashed in central Sinai near El Arish city, north Egypt, October 31, 2015. An Egyptian newspaper reports that local experts have come to the preliminary conclusion that the most likely cause of the crash of Kogalymavia Airbus A321, which killed 224 people, was engine explosion. Russian experts believe that the crash was more likely to have been caused by the destruction of an engine followed by an explosive depressurization of the aircraft's fuselage. On November 4 Egyptian newspaper Al-Masry al-Youm reported a new theory of the Russian plane crash, which took place in the Sinai Peninsula on October 31. Citing "sources in the commission of inquiry," it said that the transcript of the "black boxes" offered evidence of an explosion in the engine. Flight recorders did not record any emergency calls from the crew to dispatchers, however, according to Egyptian sources the "presence of a powerful explosion, simultaneous loss of all engine power, a fire in part of the fuselage and the destruction of part of the plane in the air” was evident. 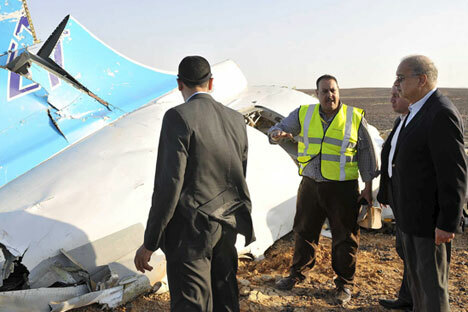 The investigation team and technical commission working at the crash site – experts from Egypt and Russia and France and Germany as the countries producing the aircraft, as well as Ireland, where the plane was registered – still do not reject any of the initial theories. A terrorist attack aboard the plane, a fatal piloting error or a technical failure that resulted in the destruction of the aircraft in the air are still considered possible explanations. The fact that debris spread over a vast area – 8x4 kilometers – also supports the reports that this Airbus A321 fell apart at a high altitude. The UK government, which is not involved directly in investigating the causes of the crash, acknowledges the possibility of a terrorist act. "While the investigation is still ongoing, we cannot say categorically why the Russian jet crashed," the British prime minister’s office said. "But as more information has come to light, we have become concerned that the plane may well have been brought down by an explosive device." Due to the new information, all flights from Sharm el-Sheikh to the UK were suspended to allow time for British experts to assess their safety, it added. According to British experts, United Kingdom authorities "never accept such measures and do not make such statements without sufficient grounds." Russian experts close to the investigation of the crash believe that it is too early to make preliminary conclusions. They point out that the theory of the engine explosion does not look very convincing at this point. According to them, the very design of the engine is such that a relatively small amount of fuel-air mixture could not "assure" a powerful explosion that could lead to the destruction of the aircraft's fuselage. If the flight recorder's data does indicate a problem with the engine, theories would likely turn to revolve around its destruction. According to experts, in the case of a so-called non-localized destruction of a turbine its torn-off blades fly out with great speed and – moving towards the plane – could cut the liner's wing and fuselage like an angle grinder disc. The so-called explosive depressurization of the fuselage then takes place, which leads to the complete destruction of the aircraft. The fact that the flight recorders did not record any complaints of pilots to the ground crew before the accident would be quite understandable if the explosive depressurization of the cabin occurred because they would not have had time to react. On the initiative of the Russian side, the search for the wreckage of the aircraft has been extended with the search area being expanded to 40 sq. km. To establish the exact cause of the disaster experts will not only have to fully decode the data from the flight recorders, but also to collect all the debris to reassemble them in the hangar for careful inspection. Meanwhile, in St. Petersburg authorities began to return the bodies of Airbus A321's passengers to relatives. The identification of victims of the disaster continued for a third day and as of now 39 people have been identified.